Synopsis- On an impulse, Trudi-Ann Tierney, Sydney producer and former actress, goes to Kabul to manage a bar. She quickly falls into the local TV industry, where she becomes responsible for producing a highly popular soapie. Trudi’s staff are hugely inexperienced. They include Habib, the Pashto poet who wants to insert allegorical scenes involving fighting ants into the scripts; Rashid, the Dari manager, who spends all day surreptitiously watching uncensored Hindi music videos; and the Pakistani actresses who cross the border to Jalalabad (‘Jallywood’) to perform roles that no Afghan actresses can take on without bringing shame to their families. Trudi lives among the expat community – the media, the burnt-out army types now working as security contractors, the ‘Do-Gooders’, the diplomats – in dubious guest houses like The Dirty Diana. This is ‘Ka-bubble’, where the reckless encounters with each other, with alcohol and of course with recreational drugs are as dangerous as the city’s streets. Here are crazy people living crazy lives, and locals trying to survive as best they can against the backdrop of war. Review- I have a soft spot for travel memoirs because I quite simply like to live vicariously through other people’s travels… it keeps me satiated until I can have a travel hit of my own. 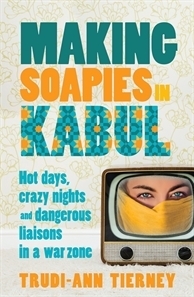 So, when Making Soapies in Kabul showed up on my doorstep, I couldn’t help but accept it for review even though I felt completely overwhelmed by the influx of Feb/ Mar review books that arrived while I’m in the midst of renovations! Amid the chaos of my own home, I found brief interludes where I could sit down and read Trudi-Ann Tierney’s adventures in a land just as chaotic and thrilling. Sydney-based writer and television producer Trudi-Ann accepted a bar manager role in Afghanistan on a whim that she may land a role in the TV industry over there. Working in a bar in a country where alcohol is closely monitored wouldn’t rate among one of the safest or smartest jobs in the world, but Trudi-Ann throws herself into her work and embraces the teachings of living in Afghanistan. Miraculously, Trudi-Ann does manage to get a position in the local TV industry… not quite the first job that comes to mind when I think ex-pat in the Middle East, but that’s what makes this story so interesting! She works with inexperienced locals, quirky ex-pats from across the globe and creates elaborate television drama with little to no resources. Somehow she and the team manage to pull it all together and make several successful television shows that rate highly among the Afghans (well, some of them). What I love about travelling and in turn about travel memoirs is discovering something new about a culture and the way that people live. I thought it was fascinating how the actresses would cross the Pakistan border to perform the roles that would be too dangerous for Afghan women to play. It was also funny to think that they thought Trudi-Ann, in her late thirties, was an old woman and that despite her authoritative position and being a woman she gained the respect and admiration of the people she worked with. While I found the cultural aspects of the story to be the highlight and the number of odd situations that Tierney finds herself in, I didn’t feel I really got to know Trudi-Ann. She provided a lot of insight into the backgrounds and lives of those she met during her escapades but apart from working hard, drinking hard and occasionally falling apart, I didn’t feel much of a connection with the narrator of the story. It was only really when the extent of her suffering, the grief and loss and the exhaustion near the end of the book was revealed did I actually empathise with her. I guess I did enjoy seeing how she made the best of a bad situation, but in some respects I wanted to know just how hard it was to adapt to this way of living and what exactly the pull was to Afghanistan that kept her there for three years. There were times when I wasn’t quite sure where the story was heading and what the point of it was. I did get a little bit bored around the 100 page mark because I wanted to see the protagonist, who in this book is a real-life character, to show some growth and change, but I didn’t get that sense. Regardless, it was an entertaining read and a fascinating look at a country I didn’t know much about and the exciting television industry. I really enjoyed this Lauren though, probably a little more than you.